LS-F14958 is a 96-well enzyme-linked immunosorbent assay (ELISA) for the Quantitative detection of Mouse BMP6. It is based upon a Custom assay principle. 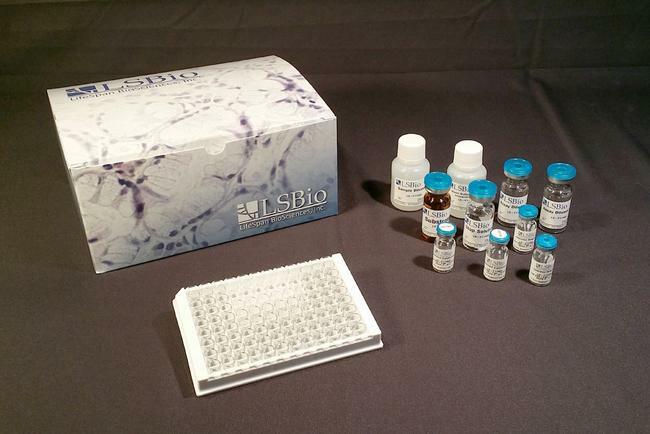 All LSBio Custom kits have been predesigned and all necessary components, including antibodies and standards have been identified. Upon receiving a custom kit order, the kit will be assembled and quality control tested before being shipped out. Kit assembly and testing typically takes 4 to 6 weeks. In most cases the final kit is based on the Sandwich assay principle, with a few being Competitive EIA based. Specifications such as Range, Sensitivity, and Precision are defined upon completion. In the event that the custom kit cannot be successfully developed with 6 weeks of the order date, the customer will be notified and the order canceled at no cost.